7th Street Surf Shop has been giving surf lessons to the public for over twenty five years. Since the shop opened in 1986, literally thousands have learned to surf with our lessons program. The development of SOFT, SAFE surfboards has changed the mix of students from mostly pre-teen/teenage boys to include entire families and large number of girls. We have students from six to seventy six years of age. If a child can swim well, he or she can learn to surf. We offer group and private lessons as well as surf camps. All lessons are given directly in front of our boardwalk shop, located at 654 Boardwalk, at the lifeguard protected surfing beach, 7th Street Beach. All surf lessons and camps must be pre-paid at sign-up. The student(s) may cancel his or her lesson with at least twenty-four hour notice and will receive a full refund. Our surf lessons and camps fill up fast, so early sign-up is recommended. Private lessons cost $60 for one person, $90 for two, and can be given any time on the hour past 12:30pm. A private lesson consists of one hour with your surfing coach, plus an added half hour of solo practice with the provided soft surfboard and wetsuit. Private lessons can be for any ability level, beginner to advanced. The student is welcomed to bring his or her own equipment to tune up their abilities on their own board. Group lessons cost $40 per person and include the use of both a surfboard and a wetsuit. Durning the summer, group lessons are given seven days a week at 8am, 10:30am and 5pm (weather permitting). This is the lessons program that most people know us for and talk about. Over ninety percent of our students stand up and ride waves within the first half hour of their lesson. Our emphasis is on safety and fun. the teacher to student ratio is never more then three students to one surfing coach. Our average group is fifteen students and five coaches. The total lesson lasts two hours: the first half hour is "on the beach" instruction; next a full hour in the water with your coach, and in the remaining time the students practice with his or her board alone. Located at our shop at 654 Boardwalk, rental surfboards, stand up paddleboards, bodyboards, skimboards and wetsuits are available daily all summer. All surfboards are soft, safe surfboards, ideal for surfers of any age or skill level. We carry wetsuits in all sizes; spring suits for the summer season and full suits for the spring and fall season. Rentals are available hourly, daily and weekly. We also offer a delivery for daily and weekly rentals for a $5 fee, and can deliver and pick up equipment between 8am and 6pm. For more info, please call (609) 391-1700 or visit our 654 Boardwalk shop. Surf camps are given every week all summer. Each camps run for five days (Monday through Friday) and you have the choice of 9am till 12pm or 4pm till 7pm, for $275. 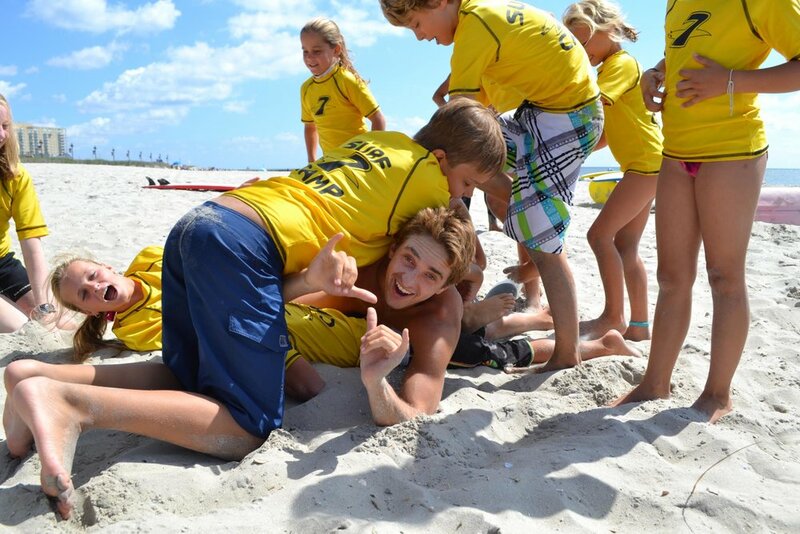 Surf camps are available for beginner and intermediate surfers ages 9 to 16 years of age. Campers are provided with surfboards, wetsuits, along with a rash guard that the camper keeps at the conclusion of their week in camp. In surf camps, campers will not just learn to surf, but also learn about the ocean. We teach overall ocean safety, and about local sea life in a fun environment. Camps are not just about learning, they are also super fun. Camp coaches run daily contests and games that change day to day and week to week. 7th Street Surf Camps are not a lesson. It is a total fun experience. For more information, or to meet the coaches, please call or stop by any of our locations. We will be in touch shortly. Please feel free to give us a call during business hours for a quicker response.